The sixth astrological house is the second house of the earth in the growing order of the Zodiac. The first house of the earth was in the second house, where we started stabilizing our value as different beings. We have started feeling that we are different from the “All” in the first house. It is the perception of the senses, which offer us the value of what we really are. The astrological house number 5 is the manifestation of the “I” with its particularity. It moves the sense of excess and we do not believe in being all (in the house number one), but we do believe that we can make all. 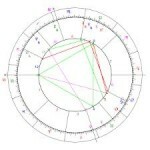 Thus, this sixth astrological house come to put order to the meaning of each of the houses and the signs of the earth. It has come the time in which we need to evaluate ourselves, to look for priorities, to evaluate the usage that we do with our power and, above all, recognize the limits and the truth of our nature and the capacity, to put it this way, of auto-critique. The reality always has two aspects: what we are and what there is outside. It is also the correlation of what we are inside as “mind” and “feeling” and the external world, the form and the body. This house is associated to health, work, the services and the necessary process to adapt ourselves to what we have close to use. The planets and the signs that are in this house suggest how is our relation with our health, which are the best Jobs for us and where can we be of the most useful.